Events in this post occurred in June and July 2007. Friday, June 29, 2007, Kathi and I were staying at the Restway RV Park in Cheyenne, WY. We arrived on Tuesday and our plan was to stay until after the July 4th weekend, so we planned to leave on July 5th, which was the following Thursday. We were on the way to the mountains in Montana and taking our time getting there. Across Wyoming you go on long treks, because there are not many respites for RV travelers. We were at home with our windows open, enjoying the cool weather and moderate breeze. Kathi talked to AJ, our oldest son. He and his friend Charlie were going to play at a coffee shop. Charlie sang and AJ accompanied with his guitar. AJ liked it because they were playing original songs that he wrote. Saturday we drove around the area for a little while, until Kathi started feeling bad with her blood pressure up and not much success getting it back down. She stayed in bed for the afternoon and evening, hoping she would feel better in the morning. She did, but she had a stuffy nose and suspected all the cottonwood trees in the area might be the cause. We spent most of the rest of our time in Cheyenne inside and prepared for our move on Thursday. We left Cheyenne mid-morning and took I-25 north through Douglas and Casper on the way to the KC RV Park in Kaycee, WY. Mileage was about 245 and I figured it would take us four to five hours to get there. About the only thing we saw along the way was beautiful scenery – and that was enough for us. KC Park rates were $19 per day using our Escapees discount. We signed in for two days. I like to have a rest day between travels, especially after long trips. My preference is 100 miles per trip or less, but you cannot do that in Wyoming -- it is too sparsely populated. We did not unhook our Jeep, since both of us were congested and we just wanted to stay inside. Saturday, July 7th was moving day again. We were leaving Kaycee, WY and moving to Livingston, MT. It was about 325 miles – much further than I wanted to travel. At least we would finally be in Montana. We left Kaycee on I-90 north through Buffalo, the Bighorn National Forest and crossed the state line into Montana. We went through Hardin to Billings, then turned west, still on I-90 to Livingston. We could have broken up the 325-mile trip in two pieces by stopping in Hardin, but we had spent a week at the Hardin KOA in 2004 and Kathi did not want to stop there again. I do not blame her, there is not much in Hardin. We loved the beautiful scenery driving through the mountains and moved into the Livingston RV Park. We signed in for two days at $23 per day. There was not much in the park. We chose a space in the back with no trees, so they would not interfere with our satellite dishes. We only had water and electricity, but that would be fine for two days. It was hot and our RV was hot, so we drove around town giving the RV time to cool off. 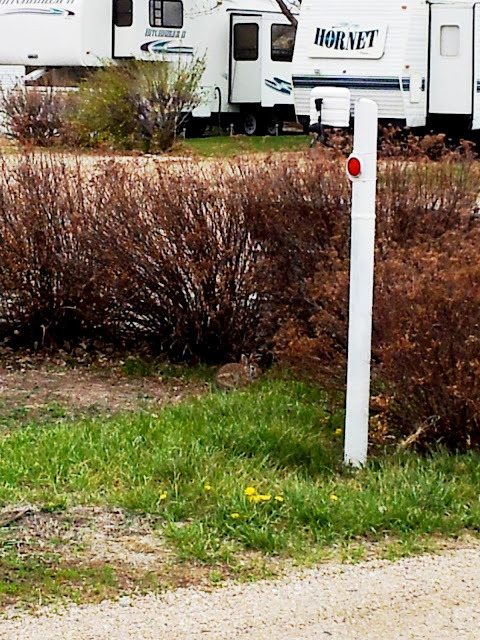 Rabbit hiding in RV park in Wyoming. This picture is from June 12, 2004 when we were staying in Cameron, MT. It was like a blizzard for about an hour.